Spit shinin’ the ol’ game, make ‘er all nice and pretty. 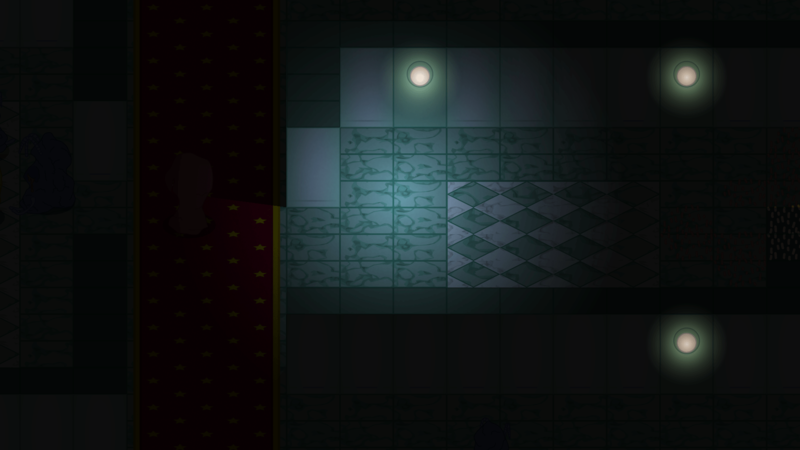 Improved movement around corners, as discussed in my previous post. 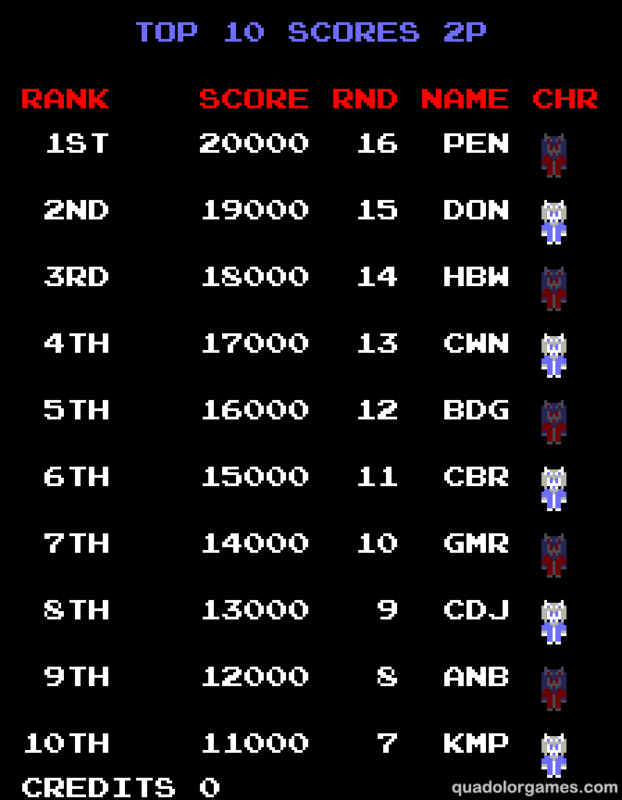 Bumped up the score requirements for getting extra lives, from 20k/40k/60k… to 20k/50k/80k… I felt that getting extra lives was a bit too easy in previous versions, especially in the later levels where points are more abundant. 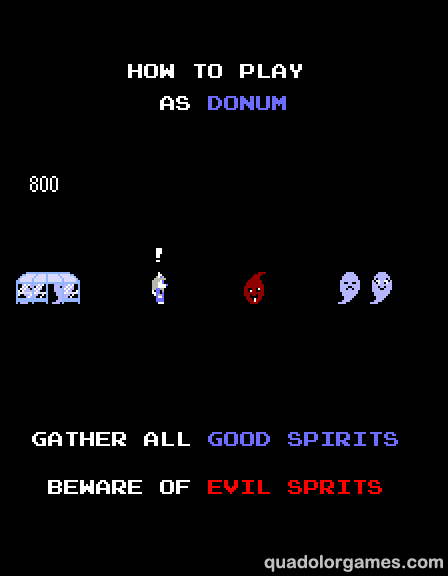 Players are reminded of the requirements on the title screen. Updated the user interface. If either player gets more than 5 lives, the lives counter just draws one icon and then the number of lives. (Shown in above screenshot, sort of. Just imagine a number beside Donum’s icon on the lower-left.) Before it would keep drawing icons the more lives a player has, eventually intruding on the space of the round counter and the other player’s life icons. I was surprised it took me this long to realize this problem. In addition to that, I’ve added small indications that appear when a player picks up a power-up item (P): “LOnG” for the first pickup that extends shot range, and “DBL” for the second that gives the player a double shot. Before this friendly reminder, the power-up item was the only item that did not obviously indicate what it does. Rewrote the help manual and changelog as a Compiled HTML Help file (CHM). Now in colour! Images, links, and an index! Multimedia for the win! But seriously, the manual looks much better and easier to use now. 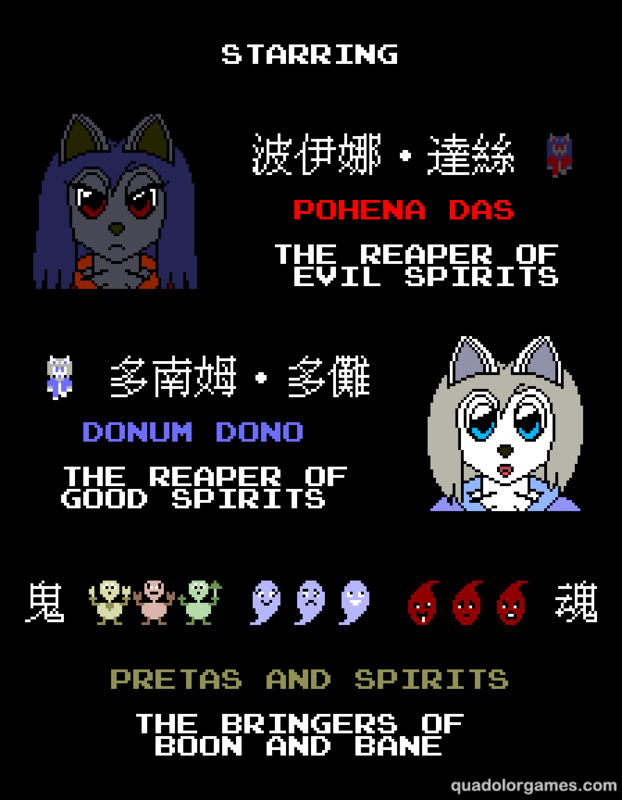 Lastly, I updated the “Starring” screen to include the new, and possibly finalized, Chinese names for the characters. This time I opted for a transliteration than is biased towards the pronunciation of each Hanzi rather than the meaning,, using this chart as a basis. 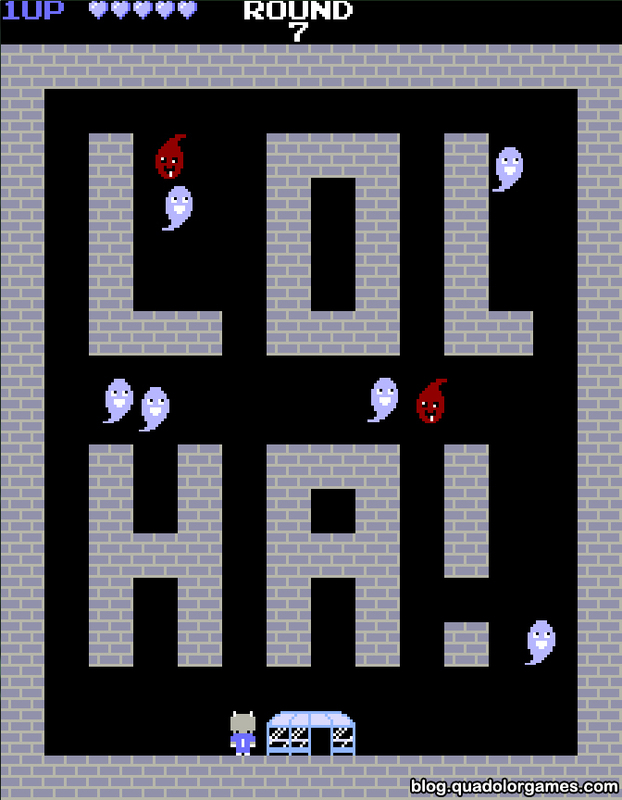 The problem I had with Pohena’s old name (魄伊娜) was that the Cantonese pronunciation for it didn’t sound very nice (paak3 yi1 naa4), and being the Chinese dialect I grew up with, it was gnawing at the back of my head. It does work very well in Mandarin (po4) though and its meaning is relevant (魄 = “soul, spirit”), but still. As a compromise, her name is now 波伊娜. 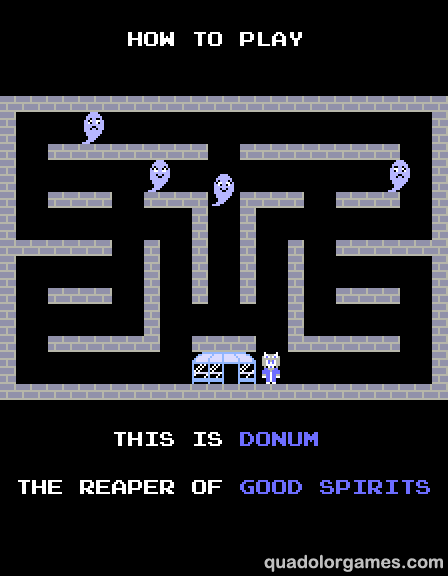 I had a similar problem with Donum old name; actually, it was much worse: 當納睦 ・ 當儺, dong1 naap6 muk6 dong1 no4. I also decided to simplify his name and came up with 多南姆 ・ 多儺. Fun fact: his last name, 多儺, can be interpreted as “many exorcisms of evil spirits”. It would fit Pohena better, but meh. I plan on rewriting the bio pages on this website, not just to update the names, but because the info on there is out-of-date. The lore of the Gonna Catcha universe has changed since I put that page up. 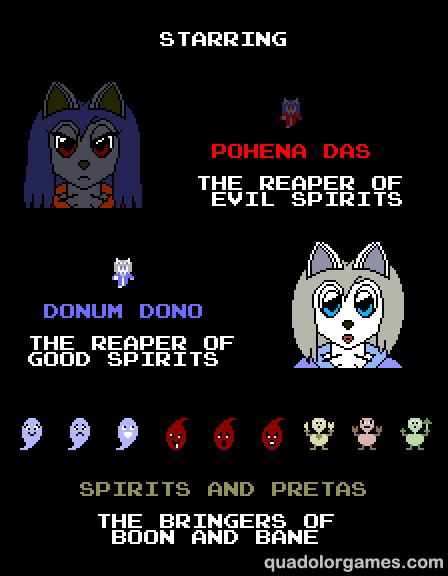 I’ve also considered incorporating it and the other extended descriptions of the game linked on the game’s info page to the manual. That will be part of my next update. P.S. The Japanese transcriptions for their names are unchanged for now: ポイナ・ダス (Poina Dasu) and ドナム・ドノー (Donamu Donō). I don’t know why I decided to put that out there. P.P.S. Wish I knew something about transcribing to Korean Hangul… and Vietnamese. The end is nigh. Muwahahahahaha! 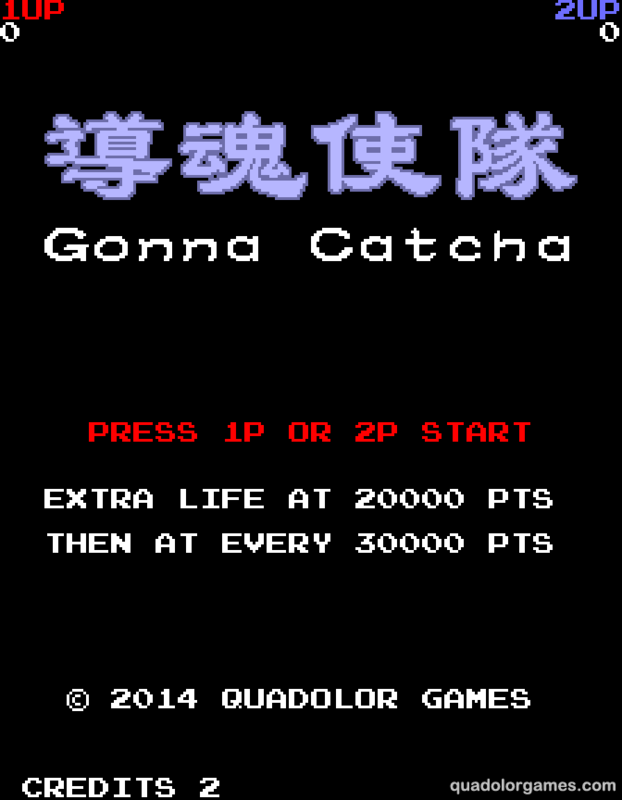 It is a joyous occasion; Gonna Catcha is now feature-complete. 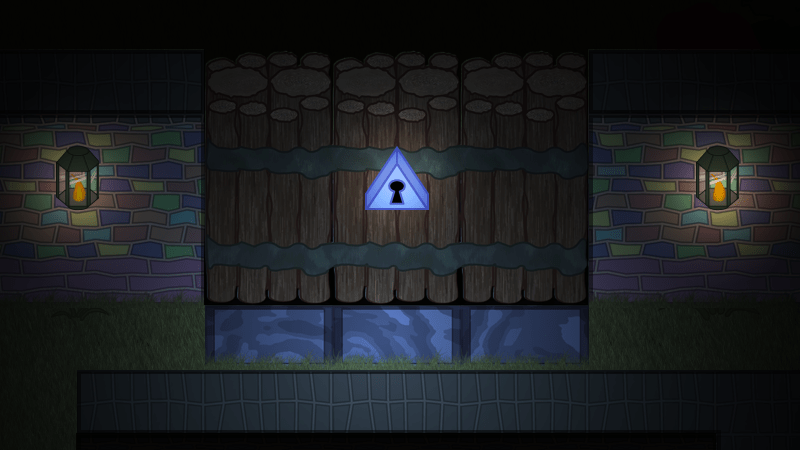 Everything I set out to do with the game is done aside from a few tweaks here and there. 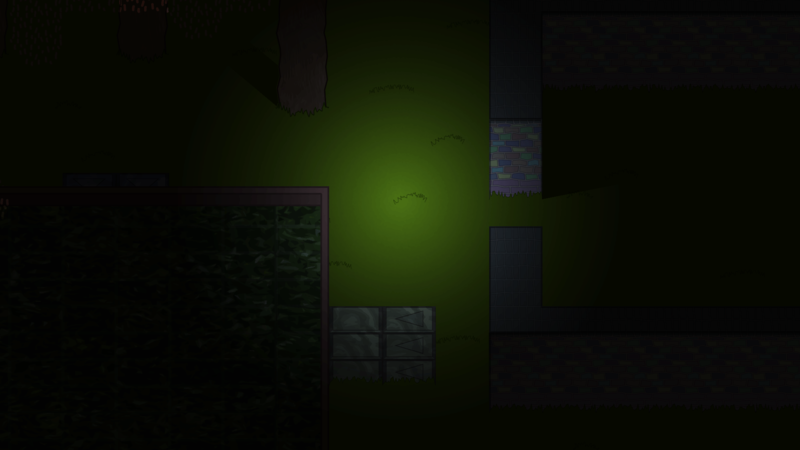 In v.0.9.0, I made two major sets of additions, along with some minor improvements. 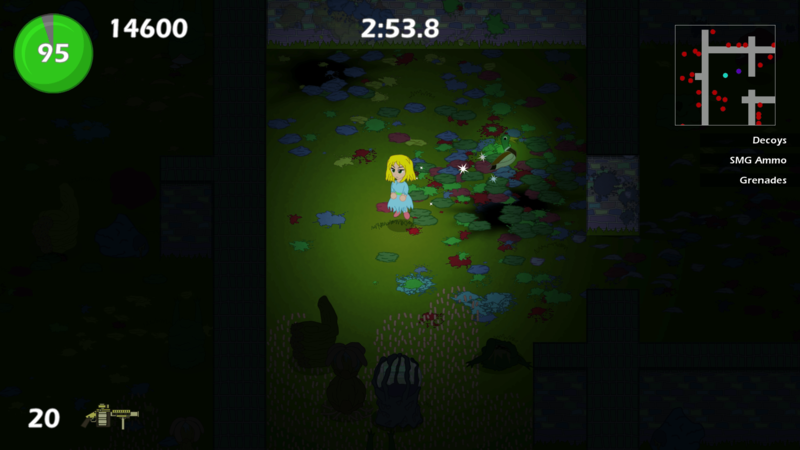 After the introductions, the attract mode switches to a gameplay demo. 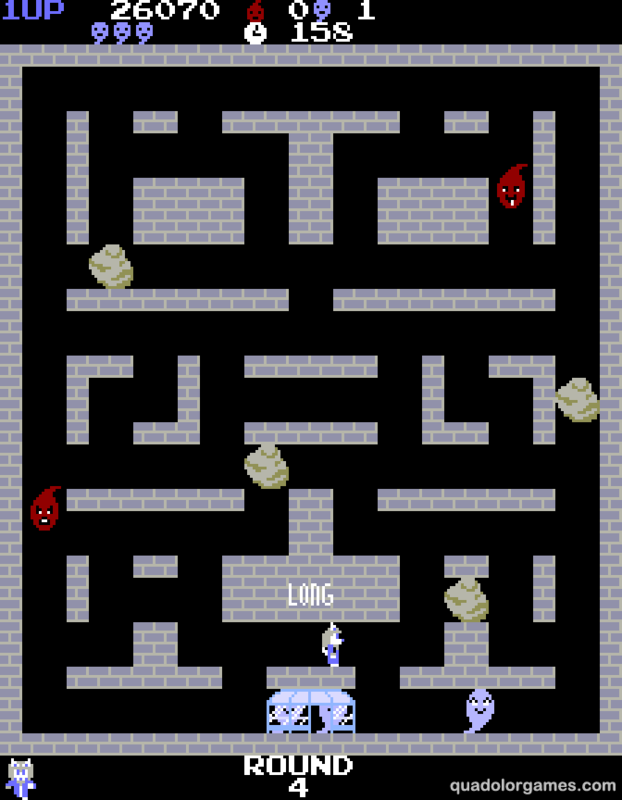 This where the game’s autoplay system plays back one of my attempts at beating the first round with both characters. As was the style at the time, the attempt was poor. I’ll buy YOU for a dollar! 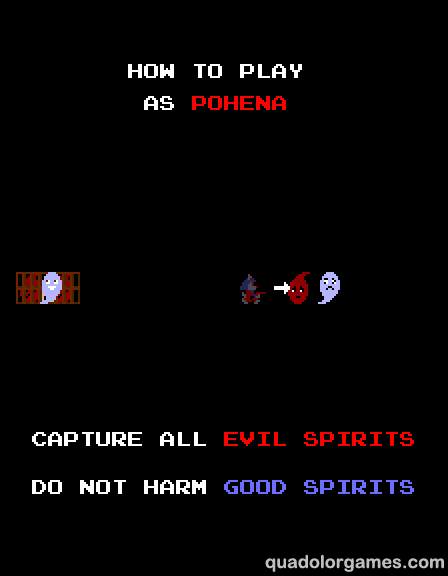 The second set of additions are the tutorial sequences that teach players how to play the game, replacing the instructions screen in the previous version. 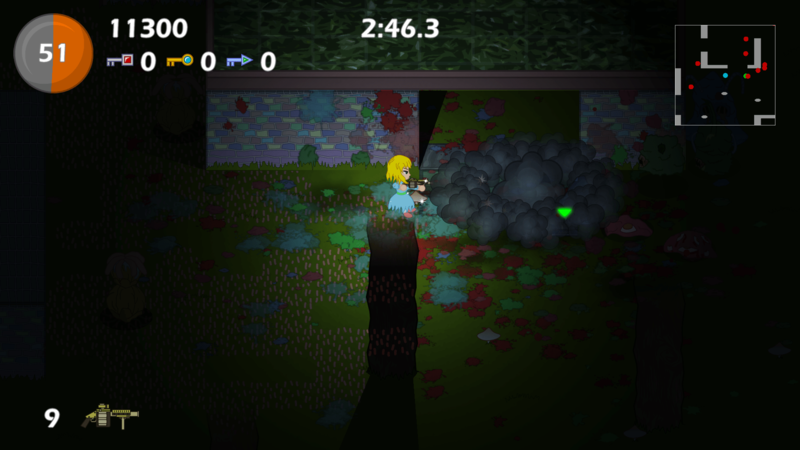 The tutorials demonstrate, by example, the basic rules of the game: what each player character’s job is and what they can or cannot shoot. 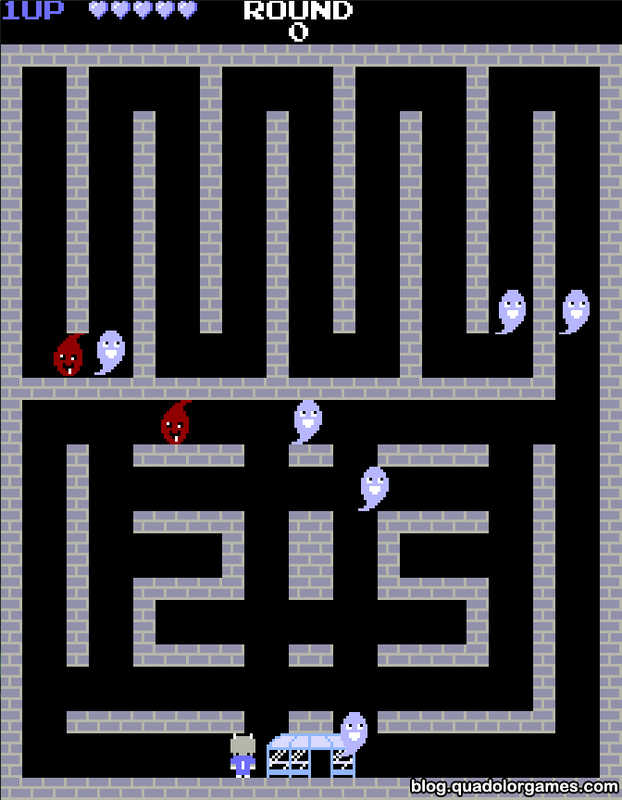 There are four in all; they are shown before Rounds 1, 2, 3 and 8. Enough talk! Go download and play it right now! This is no doubt the biggest change to the game since the latest update. Instead of only keep track of one high score value, Gonna Catcha now keeps track of twenty high score values: the top ten for single-player and the top ten for co-op. 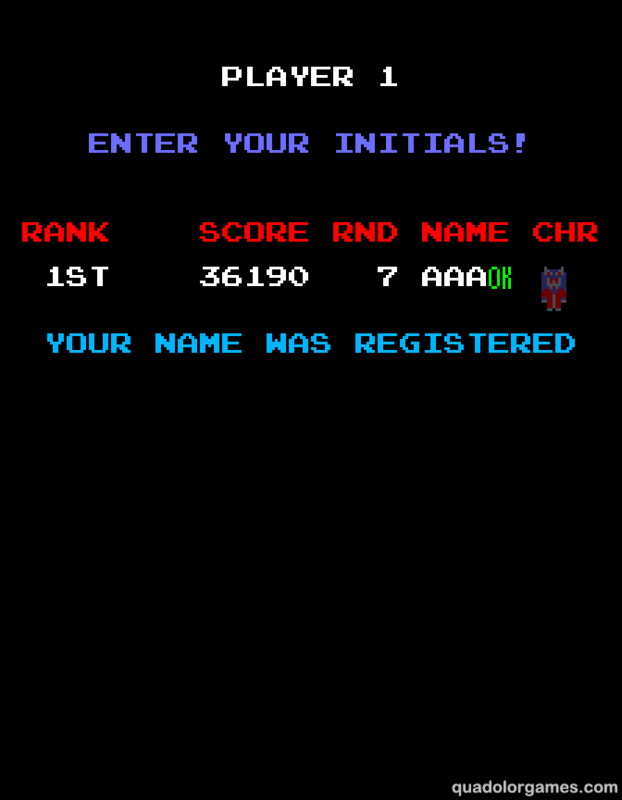 Not only that, it also keeps track of the highest round reached for that playthrough and, of course, the player’s initials, so that your valiant efforts will be remembered forever for future generations to admire, until someone bumps you off the list. Hmm, better stock up on quarters and snacks. As I mentioned earlier, Gonna Catcha will played in an arcade-style environment at the Bit Bazaar. As such, players won’t be able to read the manual to figure out how to play the game. Heck, they won’t even get the luxury of instructions printed on a cabinet. Sure, I’ll be there to help people out if needed, but frankly, after explaining the rules to the many new players to the game in previous playtesting sessions, I’m getting tired of it. 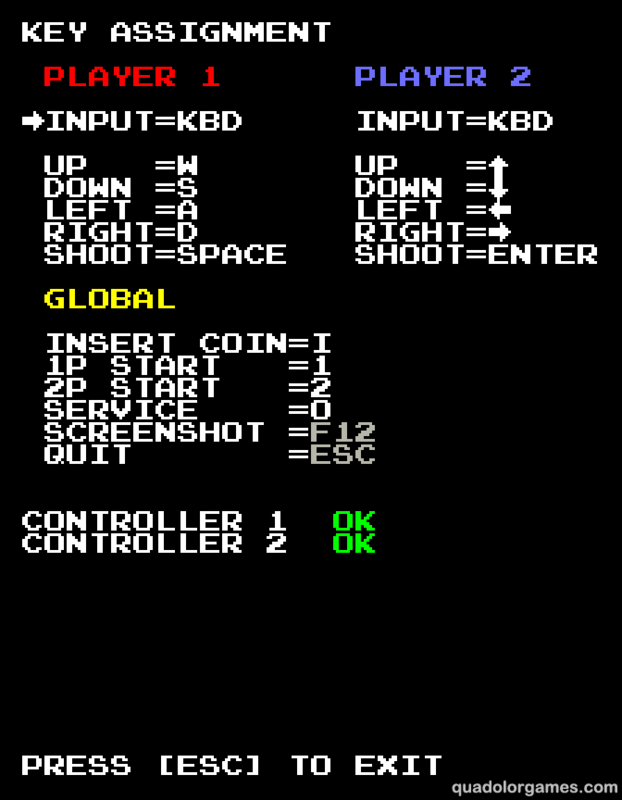 To minimize confusion and delay, I added the above instructions screen, which is shown just before the first round starts. This explains the basic rules and goal of the game: what you can touch, what you can shoot and what the heck is going on. 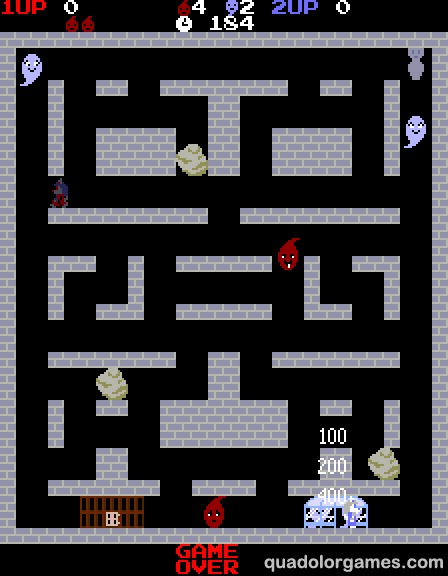 The game’s “hidden” rules can be learned through experience. Hey, at least I’m not charging anyone multiple payments of 25¢ to learn the game by trial-and-error. How high far can you get? I’ve probably played Gonna Catcha more than anyone else in the world, and because of that, I’m probably the most likely person to get bored of it. One problem I’ve noticed in my playtests is the round progression. 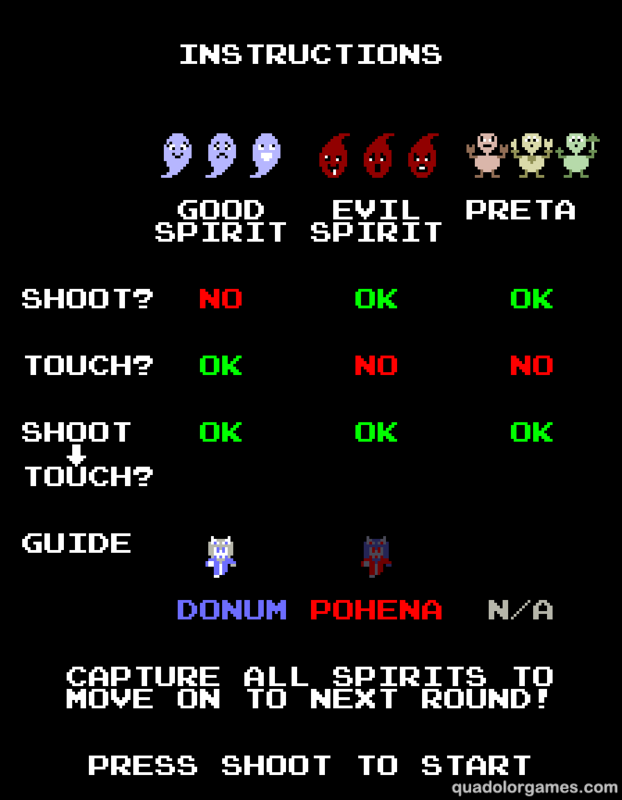 Originally, you needed to play four straight “regular” rounds of spirit catching before you hit the bonus round, and then afterwards the maze changes and the cycle repeats. 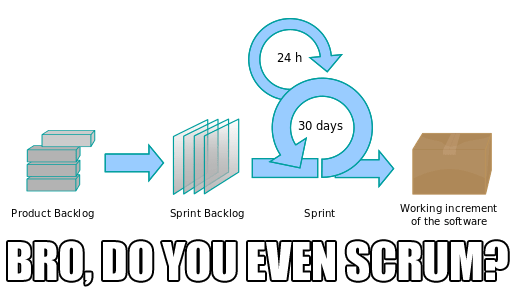 In all my playtest sessions, I was playing co-op with another player, and I felt fatigued at the fact that I had to endure four rounds of pretty much the same gameplay before two major gameplay changes happen one after the other. It’s not as bad in single-player because the character you control, and therefore the gameplay, alternates between rounds. Still, I knew something had to be changed for the sake of co-op mode. I just moved the bonus round into the middle, i.e. This way, instead of having two major changes to gameplay every four regular rounds, now there is one major change for every two regular rounds. Hopefully by spreading out the changes, it will make the game more interesting to play for longer. One minor annoyance I had with Gonna Catcha while playtesting it was that I couldn’t pause the game when the other player had to attend to something else for a moment. After all, why would I need to put a pause function in an arcade game? There’s no time for pausing in the arcade business, time is money. 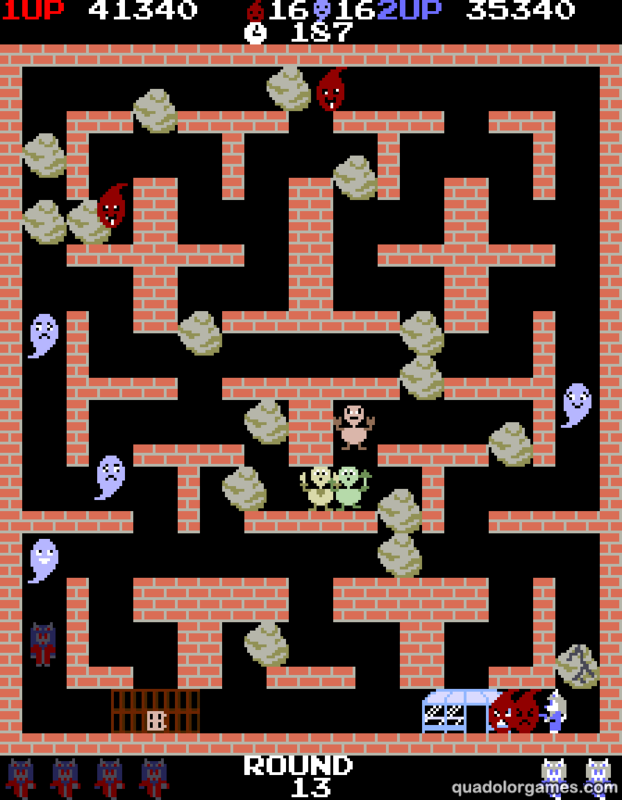 However, since I’m not really interested in extorting quarters and attention from people in exchange for making it on the high score list, and the fact that I’ve already violated a few limitations and conventions of early-1980s arcade games, I decided to put a pause function in the game for the sake of convenience. 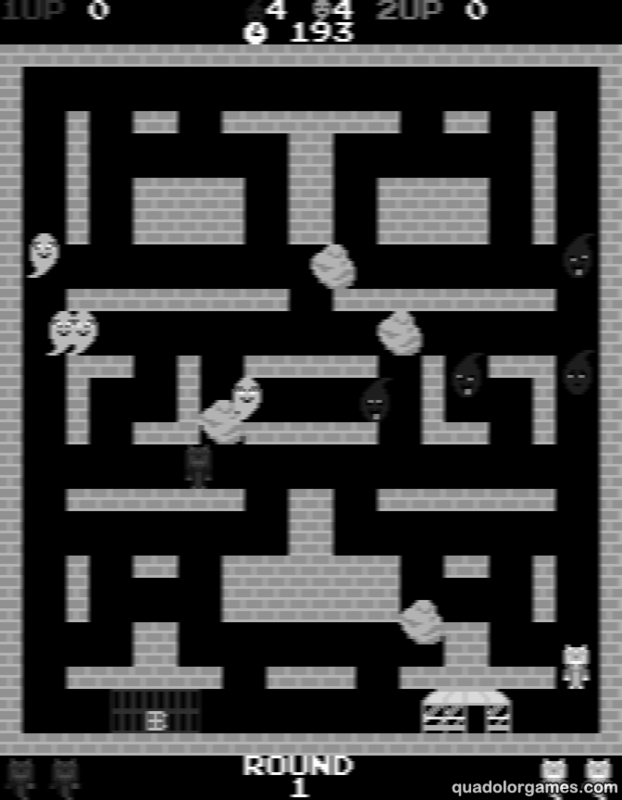 Actually it was more like taking he pause code from Rise & Fall (shader and all) and plopping it into Gonna Catcha, hence the black-and-white blurry effect. *ZA WARUDO! Toki yo tomare! 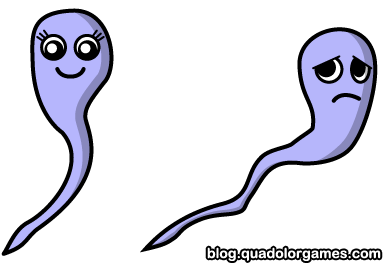 It seems like a long time since I last wrote a post. 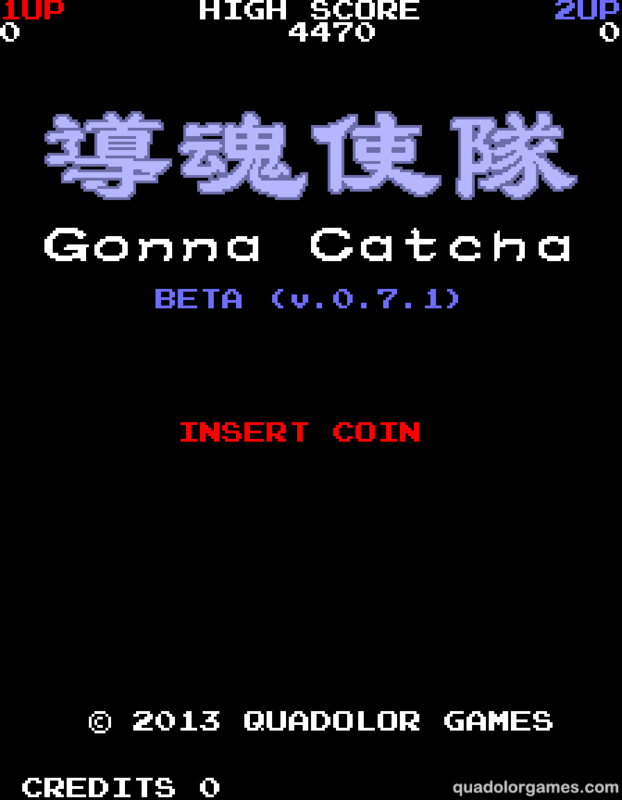 Since I’ve released the beta demo of Gonna Catcha, I have been less compelled to write about it since it’s much easier to learn about the game by playing it than sitting here reading about it. Also, I was going to post about the International Archaeology Day playtest session with Rise & Fall, but the post ended up being not very interesting on it own, so I’m going to combine it with the Gamercamp playtest session post I’ll write about after Gamercamp, which is happening right now. Yay. In the meantime, I suppose I can talk a bit about what was added to Gonna Catcha since it’s release. Aside from several major bug fixes that somehow slipped through my keen eye, the biggest update to the game is the inclusion of several new options in the game’s Service Mode (fancy arcade talk for “Options Menu”). I feel like I’m being very thorough with the amount of customization you can do with the game, and I haven’t even put in the sound test or let the player customize gameplay settings yet. 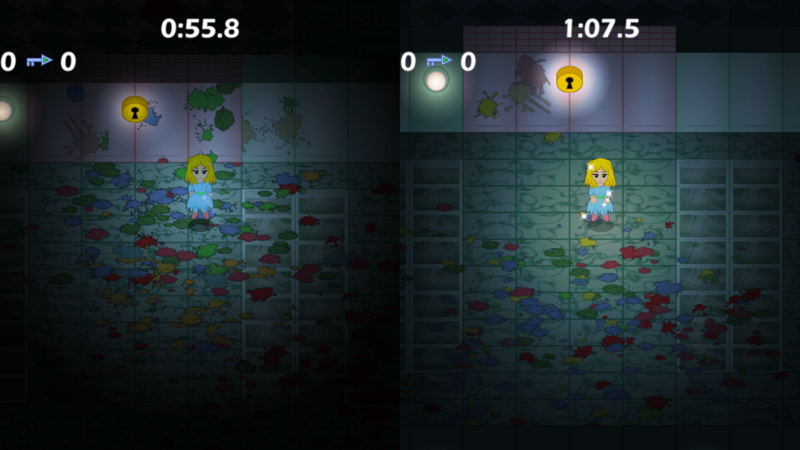 During the development of the co-op mode, I had difficulty deciding how to bind the controls to what keys on the keyboard without the two player bumping their hands into each other. Also, what might be the ideal key bindings for co-op might not be for single-player mode and everyone has their own preferences on what the best key bindings are. 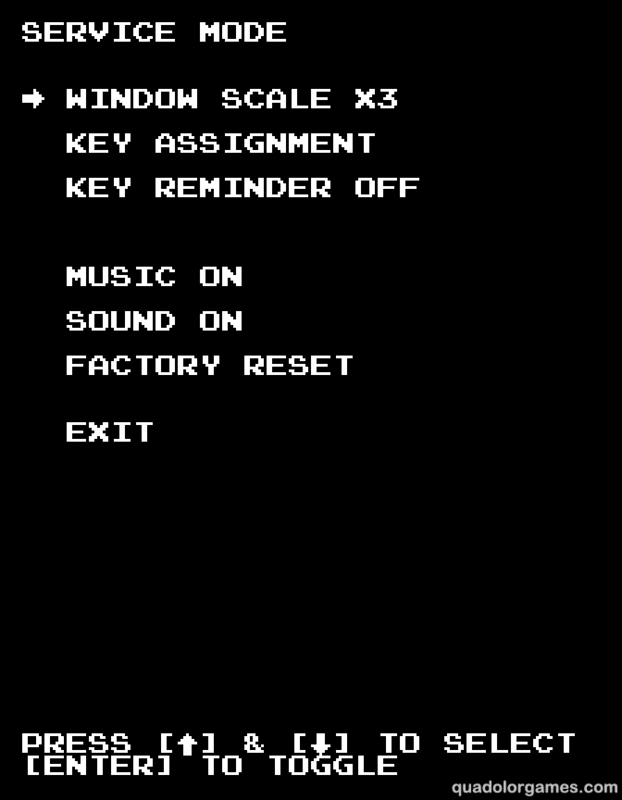 In the end, I decided to let the player(s) figure out what controls work best for them and put in a key configuration menu. 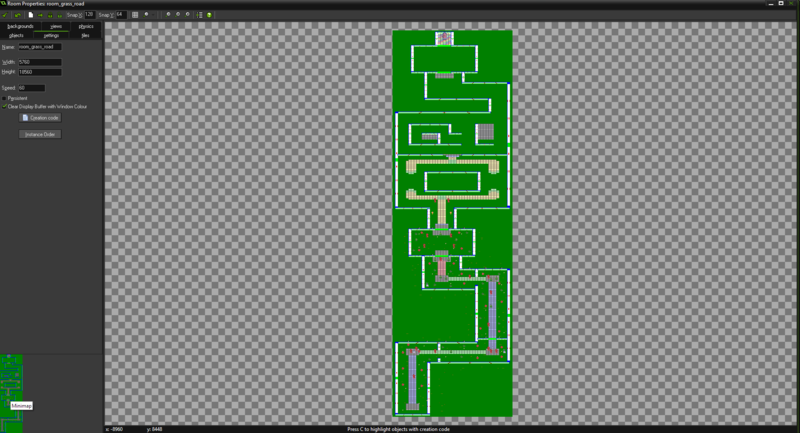 This is the first time I’ve made a key binding system for a game and it turned out to be less trouble and error-prone than I imagined. 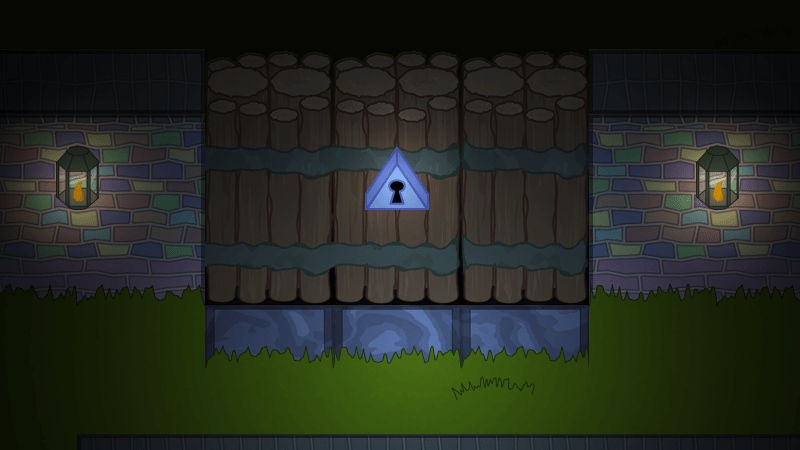 GameMaker: Studio has built-in functions for rebinding keys, but I ended up creating my own solution. I have received some feedback from people who played the demo. 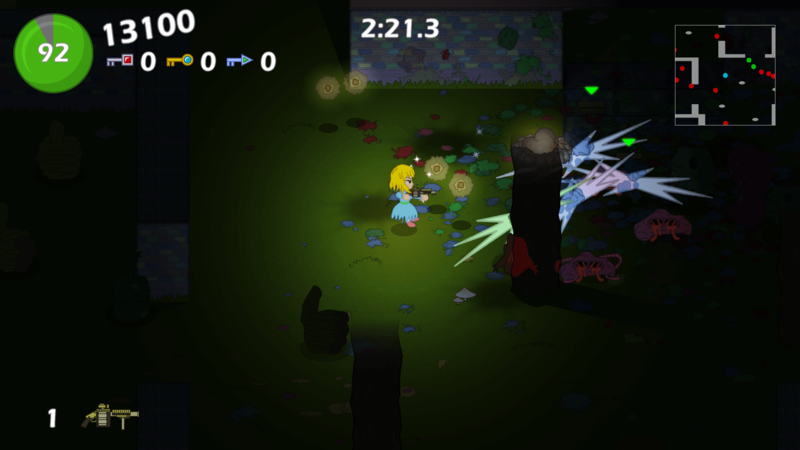 Aside from pointing out the bugs, most have praised the retro arcade art style and audio of the game, saying that it’s quite accurate and devoted. One thing that came up was some people had trouble getting the game started because they couldn’t find the “Insert Coin” key. So to help new players, I added “key reminders” on the title screen to help them get started. 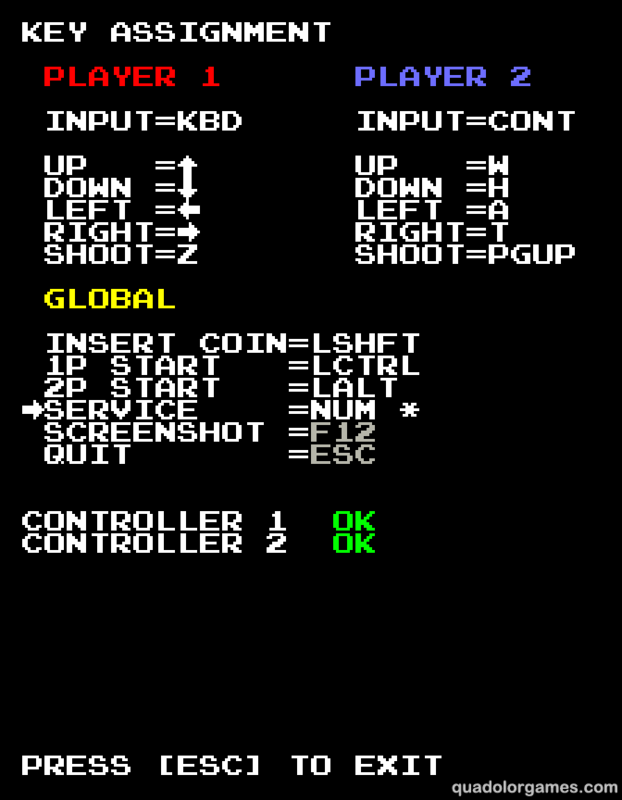 I also made the list of default key bindings clearer in the manual (if people actually read that thing). for those acquainted with the controls, there is an option in Service Mode that allows you to turn the reminders off for a more authentic arcade experience. Oh man. *tap* *tap* Which button is it? What would make it even more authentic is an entire arcade cabinet, but let’s not get ahead of ourselves.